DVDizzy.com • View topic - Official 'Enchanted' Discussion Thread + Trailer ! Official 'Enchanted' Discussion Thread + Trailer ! 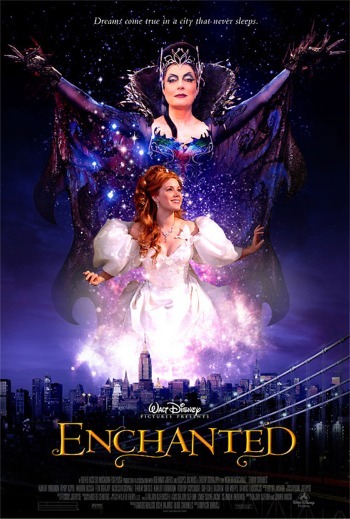 Post subject: Official 'Enchanted' Discussion Thread + Trailer ! Finially, the long awaited trailer to Disney's long awaited movie has finially become availible for download! I can only hear the audio and have no picture unfortunatly, so if someone could post what it looks like please? The audio sounds FANTASTIC though! Here it is for download! (It will be attatched to Pirates 3, if you want to see it in cinemas). I have now seen it! THIS WILL BE SUCH A BEAUTIFUL MOVIE! There is no question that Disney should go back to 2 D after seeing the beautiful animation shown in this teaser. How adorable is Giselle? I am positive she will become an immediatly popular Princess. I'm in love with her already, and I've only seen the teaser trailer and a few clips! I love the 'Grumpy' bit in the trailer. This would imply that the Disney Princesses all know eachother? As Giselle knows the dwarfs? Just a thought. Odd selection of clips they used though, regarding the Disney Classics. I CANNOT WAIT for this movie now! All we need now is a teaser poster! yeah the selection of Disney movies was weird. Toy Story shouldn't have been in it. More Snow White and Sleeping Beauty. The animation looks stunning. I can now actually see the art nouveau that inspired it. Eventhough the coloring looks a bit too bright in some spots, I have to say you can tell american animators were involved. I initially thought it would be on the level of DTV, but it looks much better. Thanks for the link. It looks good. Although the animation seems good the character design is not that great. In spite that the movie looks is gonna be lot of fun, i can't wait! Oh man I'm definetly going to see this. The Prince cracks me up. It's also cool that the witch can turn into a dragon on top of empire state building. 40 MBs!? This is gonna take time to download. I am so incredibly excited for this movie! I was going to see this just because of Idina being in it, but after seing the trailer I actually think it will be pretty good. I love the .1 second Idina is in it, just because her face is priceless. For those of you who don't know who she is, right before it shows the clock, she is behind the two leads. The movie looks awesome! I wish they had shown more of the animation plus some of the actual music from the film. AWESOME!!! Fall of 2007 right? Whoohooo!!! I feel like I've been waiting for this trailer forever!! 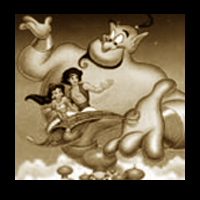 It's abslutely amazing, the beginning with the Disney classics is nice, and the animated scenes do look gorgeous!! I was a little disappointed by the pictures we had all seen, but it looks good now. A bit over-bright, but very sweet. The movie seems to be hilarious ("Grumpy") and the prince had me cracking up ("Thank you mirror"). Finally a (hopefully) good spoof on Disney chlichés by Disney themselves. I wish we could hear more of the songs, but I guess this won't be the last trailer. All in all I'm looking forward to this movie even more than before. That's awesome that someone found the trailer! Thank you! I'm a little disappointed that we didn't get a sample of the music i wanna hear the new songs! That was freaking sweet! My excitement for this film has risen even higher than it already was at. The animation here looks much more fluid and warm then the sort of sterile clip we got from the MovieSufers earlier this year. It's interesting that there'll be a change in aspect ratio, apparently ala Brother Bear. The dragon looks like a seriously scary beast, which is a relief because your hero is only as good as your villain. The movie looks like it not only pokes fun at Disney's fairy tales, but manages to do so in a good-natured way that embraces them, unlike the Shrek films. I have to agree that the choice of clips at the beginning was odd. They should've replaced The Lion King, Toy Story, Tarzan, and Fantasia with Snow White, Cinderella, Sleeping Beauty, and The Little Mermaid. Still, there was one benefit from this opening montage: it was our first taste of classic Disney animation in high-definition, and wow does it look amazing. The Tarzan and Aladdin shots in particular astounded me, especially when you pause them. You can actually see how the outlines grow thicker or thinner depending on what they're of. If only they had chosen more princess movies. I'd have loved to have seen Cinderella and Sleeping Beauty this sharp. HELP, oh PLEASE HELP !!!! Whenever I click on any one of the download links it says "internet explorer cannot display this page". No matter what link i click, wether it be the high res or the other sizes. I am dying to see this trailer and I can't. Please can someone help. If anyone has a direct link to the trailer please let me know. Just plain awesome!!!! I can't wait!!! I LOLed so much during the trailer. Frikkin' awesome! And Disney acknowledging and bragging off their film cannon! How ridiculously cool is that?! That was awesome! I am officially excited for this movie (I was a bit wary before, but now I'm assured!) The total of about 3 seconds of Susan Sarandon (plus the Dragon) look great! And now we can finally have a Disney parody worthy of calling itself a parody of Disney! Pretty funny. I'm still a little iffy. Disney fairytales are my favorite, so it's kinda hard to see them be spoofed. I guess it'll be okay. I'm mean, Julie Andrews IS narrating it!